Jr. MGT of Muhammad Mosque No. 32 in Phoenix, Ariz. help prepare food for the homeless and those less fortunate. (L-R): Thomas X, Student Minister Sharrief Muhammad and Charles Muhammad with Up with Jesus! Down with Santa! campaign posters. 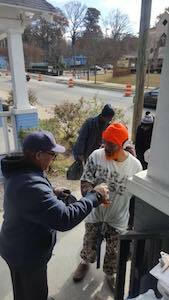 10,000 Fearless Men and Women in Atlanta distribute food and other items to residents in need. 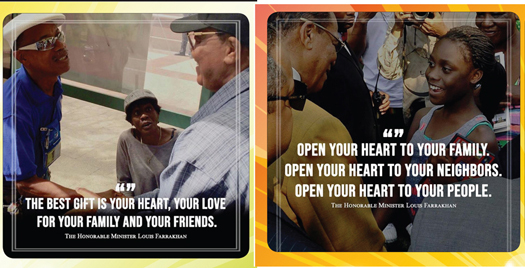 “According to Jesse Muhammad, social media flyers and posts containing excerpts of the Minister’s words about participating in acts of kindness have been heavily shared on social media across Twitter, Facebook and Instagram. “The response has not stopped,” he added. 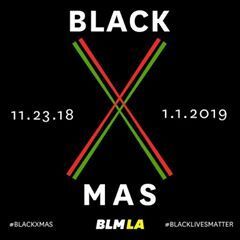 “People are saying that this is not just a revolution just for the holiday season, but this is something that has to be lived and practiced every single day that will transform our households, transform our relationships, transform our community, the Nation, and eventually it represents the new world that’s coming in,” stated Jesse Muhammad. “I think that the Minister has always been ahead of his time,” said Roc Newman, sports promoter, boxing great and host of “The Roc Newman Show,” which airs on PBS. “I don’t think I’ve ever heard him call himself a revolutionary, but he is the quintessential revolutionary. In the midst of this darkness, this pall that is over the country and to some extent over the world today and being under such personal siege by those who have no clue of who he is, his focus is talking about love,” Mr. Newman told The Final Call. “That’s extraordinarily revolutionary and those who have no interest in the upliftment of Black people, they hate that kind of message of love,” he added. (L-R): Prince Jasir, Safiyyah and Huriyyah Muhammad prepare meals for the homeless in their D.C. neighborhood. 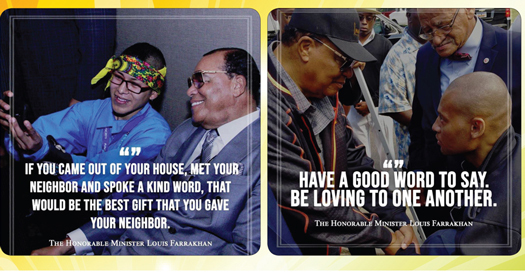 He appealed to Minister Farrakhan’s detractors: “Just listen. Just listen with an objective ear, not with a predetermined sense of who you think you’re listening to, but just listen. “They make a caricature out of someone of whom they know not. It’s long past the time for those who have been vilifying and fighting them—I speak to his enemies—don’t you know? Haven’t you realized that this is a man of God and the more you try to slay him the more he grows? Don’t you know that the more you try to hurt him, the stronger he gets? Don’t you know the more poison you try to pour onto him the sweeter he is to the people that he loves so dearly?” emphasized Mr. Newman. In Phoenix, the Justice or Else! Local Organizing Committee (LOC) responded to Min. 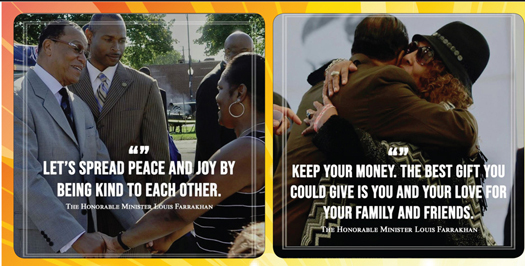 Farrakhan’s call by escalating their consistent response to the community’s needs, whether it’s help with rent, food, clothing, or shelter, according to its chair, Tremikus Muhammad. “I think that a lot of our people suffer so much, that when the Minister asked for the acts of kindness, it struck us from an angle that we didn’t expect,” he said. The call and the sentiment go way beyond just what people generally think of kindness such as just being nice to one another, Tremikus Muhammad explained. “What it has done is make people feel like they’re not alone, that they actually have someone in the community that cares. We have brothers and sisters that come to tears, because they feel like they’re out here by themselves, especially when you’re in a city like Phoenix which is a transplant city. A lot of people don’t have family here, so we create and build an environment of family around each other,” Tremikus Muhammad added. Ali Nervis has been on the giving and receiving end of that love. 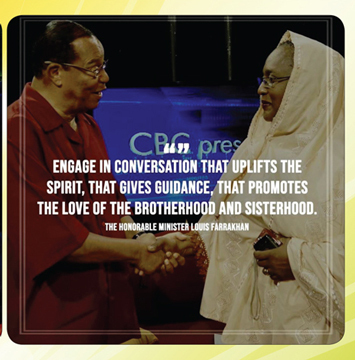 Approximately three weeks after Minister Farrakhan’s guidance to let love break out in the ghetto, the husband and father of two girls learned he had a brain pituitary tumor that had been there for 25 years. “We just found it on a whim. I had it taken out on December 14. All the symptoms came out of nowhere, I just blacked out, but love brought me back,” Mr. Nervis said through a hearty chuckle. His medical insurance covered the bulk of the $40,000 cost for surgery, but his recovery meant restricted activity. “I couldn’t leave. I couldn’t drive for a while. I was having really bad headaches, so that threw off my family’s finances,” Mr. Nervis told The Final Call. The Phoenix LOC raised money for Mr. Nervis and his family to fill in the gap while he healed, which renewed his dedication to the work and commitment to the community, he stated. “This is a type of work that it’s easy to get burn out from, and I was starting to sense that and this has been a time of rest, a time of refreshing and reawakening for me, and just a time of listening and trying to gain greater understanding. I said jokingly but it’s the truth that love brought me back— the love of my family, the love of the community, the love of those in organizations that just surrounded me and continue to send positive thoughts and energy and prayers and then this blessing was just the icing on the cake, to me, a message from even higher above that I’m doing the right things,” Mr. Nervis stated. On Christmas Day December 25, Muhammad Mosque No. 32, Blue Seas Restaurant, and Xango Fitness, Inc. teamed up to shut down the restaurant and made it only available to those in need of food, particularly the city’s homeless population. Kenny Muhammad, owner of Blue Seas, told The Final Call that Minister Farrakhan ignited his idea to close the restaurant to the public and allow the MGT and GCC (the women of the Nation of Islam) to take control of the entire kitchen. Every seat was filled in the restaurant. People placed their orders, and food was delivered to their tables with dignity as if they were regular customers, according to Hilario Muhammad, student protocol director for Mosque No. 32. He said sponsor Xango Fitness, Inc., owned by Student Minister Khallid Muhammad, provided guests with hygiene products like deodorant, shampoo and hair care products, and lotion. Guests received as much food as they wanted, including plates to go until food ran out. 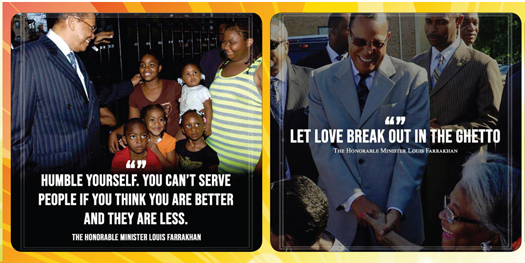 “He’s (the Minister) given us so much and we love him with a passion that when we hear him say things we know he does not speak idle words and that we are obligated to demonstrate our love for him by taking that as an instruction and moving out,” stated Zanitra Muhammad, student MGT Captain at Mosque No. 32. The MGT donated all of the food and supplies, dressed in their uniforms, and worked diligently in the restaurant. 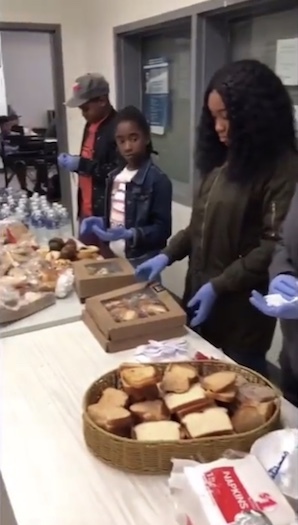 A local family of volunteers from the community responded to the Facebook announcement about the effort and helped the Muslims serve approximately 55 homeless residents, Zanitra Muhammad added. The MGT prepared healthy food and prepared it according to the Honorable Elijah Muhammad’s dietary law and books “How to Eat to Live”, she explained. Even though Muslims don’t believe in Christmas—the holiday itself—it’s about the spirit of family and unity in that family, said Kenny Muhammad. A one day shutdown wasn’t much to do in order to give homeless men and women a place to just sit down, he said. Recently, Kenny Muhammad said he was sitting in front of the restaurant when a woman approached him. “She came up and she said, ‘Brother, you don’t remember me, I’m sure, but I’m one of the sisters that you picked up,’—because we shuttled the brothers and sisters from the streets to the restaurant. And she said, ‘You don’t remember me, but I was one of the sisters that got in your van and came to the restaurant. Well, now, I got money, and I wanna buy some fish! I wanna support the restaurant!’” recalled Kenny Muhammad.